So I said this would be coming last week. Then Easter hit, and Catalyst West Coast is next week, so it’s been hard to find time to hit the blog like I wanted to. But as promised, here’s a quick rundown on my last race a few weeks ago. If you wanna skip all the details, just jump down to the takeaway. And make sure you don’t miss the bold paragraph at the bottom! So my friend James is the one who talked me into this one. 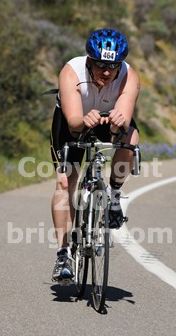 Actually, he was kinda the reason I jumped into doing the triathlon thing, and we had yet to race together. He raced the sprint while I raced the Olympic distance. It fell exactly 4 weeks before my very first half-Ironman, the Avia Wildflower. So I figured it fit well into the training schedule. I was under strict orders from Dan the man to not think about the finish line at all. This was just another training day and I needed to to be listening to my body and learning what I need to do for the next 30 days. As you might see in the report, that was tough to do. Kept going back and forth between thinking about it and not. *As a sidenote, the biggest thing I came away thinking was, “What in the world was I thinking signing up for Wildflower? !” Everything I read says Wildflower is an “iconic” race in the sport and one of the hardest long courses in the world. Oh yeah, perfect race for my first. Haha. Needless to say, I was a bit discouraged, but now I’m back on track and fired up for Wildflower. Now back to this race. The last couple races I’ve liked to be in the transition area really early to be set up and feel like there’s plenty of time to be ready to go. I was leaving at 8am, and James at 8:45, and we were staying about 15-20 minutes away. We decided to compromise and leave around 6:20. Transition area opened at 5:30am. When we got there, transition was already PACKED. I found a place to lean my bike against a fence in a corner. That was a bit disappointing. Transition area was way to small and kinda unorganized for the number of people in the event. Granted this, was also quite a bit smaller of an even than the Tri-california race I did. And this one is put on my the Tri team Cal State SLO. For some reason there was only a timing mat on the way out to bike and out to run, so no split on the transition times, so I’ll group em together. There was actually some confusion on when I should leave. Based on USAT rules, I should be in the 30 category because I turn 30 this year. But they had me in the 29 age group. It was hard to find that out. Asked once and they said they didn’t have time to check, but I should go with 30. Went back 10 minutes before start, and they checked the computer and it said 29, and that was my cap color as well. So I went down to start at 8 instead of 8:05. Then when the times came out, it had me in the 30-34 age group. Since there was no mat at the start, that sadly could mean I took 5 min. longer than they think. Not sure. But I wasn’t there for time anyway, right? It was a deep water start so we all jumped in and warmed up for a bit. After a while, the guy next to me and I were thinkin it had to be past 8 already. When were we starting? And they hadn’t told us where to start from. Some guys were still out there a ways and we were discussing this when we here them shout out that we start in 45 seconds. Guys were swimming in to get back in time to start with the rest of us. Finally we were off. First mistake, I just took off with way too much gusto right from the start. A couple hundred yards in I realized it and already started to run out of steam. A little too excited from the beginning instead ot remembering to just pace myself for a long swim. Also, this time I was racing with my surf wetsuit on. I wasn’t sure I really believed Dan and Patty that it was that big of a difference. After those first couple hundred yards, I knew I was dead wrong. My arms felt way heavy and I could just feel the weight and lack of mobility in my wetsuit. I decided for the first time to start the race at the front in the middle of the pack to see what it was like. Needless to say, it wasn’t long before I felt a wave of dudes swimming right over the top of me. I knew with my wetsuit and quick start I was in for a long swim. So I just buried my head and tried to enjoy it. The other thing I noticed was I need to do a better job sighting for Wildflower. I kept realizing that people were swimming way to the left of me in this counter-clockwise swim. So I probably swam the extra .3 miles I’ll be doing in the long course. That was the plan, of course. All part of the training, eh? I finally finished the swim just as James’ wave went out, so it probably took just over 45 minutes. As I was jogging to transition, I saw James dad, brother and brothers girlfriend, gove em a quick shout hello and continued on. Transition took a lot longer than I expected getting into my shoes and all. But I got everything covered, took some electrolytes, pounded a gel, and it was off to the bike. Bike was pretty normal and actually not too bad. The 25 mile bike was basically just 2 loops of the sprint course. There was a pretty steep hill heading out and then again coming back in, so we got to hit it twice. Even though it was a short steep one, I was glad it was there cause I need some hills to help get ready for Wildflower and Nasty Grade. Overall, I felt pretty good on the bike. It was a beautiful ride out there. There were a few decent hills out there, but nothing really major, mostly cruising alongside Lopez Lake. One of the goals for this race was also to try out my nutrition stuff which I had just gotten a couple days before from Hammer. It seemed to work out really well overall and I have since been training regularly with the gels and capsules to have my body ready for them in a few weeks here. Toward the end on the way in, I kinda wondered if my back tire was going flat by the way it was sounding, but with my momentum and no extra tube on me, I wasn’t about to stop and check. I had 2 flats in that tire on the ride leading up to this race so I was a bit paranoid. I forgot to check when I got in or even after the race. But James brought the bike back from SLO on his rack for me, and it was really flat when I got it back, so who knows. n, and being that I don’t have any bike shoes right now, those didn’t have to be changed so not much to do. Lost the helmet, moved my race number around to the front, pounded another gel, and threw another Hammer flask in my jersey. Unfortunately forgot to take a few more electrolyte capsules. not sure how that affected me, but wish I would have remembered. As an added point, I must say it is a bit discouraging realizing not many people are left to finish the bike and hearing them anounce that the awards ceremony will be starting soon while you’re in transition, all the while knowing you still have a good 6.4 miles to run. Yup, this was definitely the most brutal part of the race. You’re reading that number right, and it actually works out to a 14:02/mile pace. Ouch. From the very first step, my left knee and my right calf were killing me. They had been hurting for a while, and I’ve since visited the doctor regarding the knee. He says it sounds like Runner’s Knee and I’ll be hittin some physical therapy next week to try and at least get it under control before running 13.3 miles at Wildflower. Toward the start of the run I passed James coming in from the sprint and told him to relax at the finish, cause it was gonna be a while. Helping out were a bunch of guys in some military outfits. Not sure what braanch or who they were, but they were actually very encouraging along the way, so that was cool. I hit the sprint turnaround a bit quicker than I expected and kept on jogging toward the Olympic turnaround. Pretty much all trails on this run. And the run to the turnaround was pretty much a long uphill run. Good training for Wildflower, not good motivation when you are in pain and already feel like you’re sucking. Kept on running most of the way, at least that’s what I called it, but did have to stop and walk a few times more than I would have liked. Everyone I passed who was coming back kept saying, “Once you get to the turnaround, it’s all downhill from there. You’re on the hardest part!” Pretty much the same thing I told the few people I passed on the way back. But it selfishly was nice to at least pass someone on the way back. There were times out there that I seriously couldn’t see anyone in front of or behind me and thought I might be the last one in. About mile 4 the dull cramp like pain in my right calf became a sharp pain. I had to pull up for a minute and stretch it a bit. As I did, a few girls heading the other way said, “No shame in walking! Just gotta finish.” I smiled at em and encouraged them as they passed. Then I thought to myself, sure there is, and started up again at a slow jog just wanting to get back. Overall, I was glad I did it. It was an eyeopener. And even though it wasn’t the most encouraging race, at least after my last Olympic, I can say I properly completed one now. It got me bumpin up my training for May 2, and I’ve had some encouraging workouts since then. This tri was definitely tougher than PG was, and it helped me to get my mind off the need to do Wildflower in any sort of time, but rather to go into it with the attitude that finishing my first half-Ironman, especially at Wildflower, will be a success in itself. Probably a good mindset to be in as I head into this race. Good experience. Fun race. Not sure it’s one I’d wanna sign up for again, but glad I did it, and had a fun weekend with James and part of his fam. Unfortunately, on one hand, Wildflower will probably be my last tri of the year, and the first of the season for most people there! On the other hand, that’s because I have something BIG coming up later in the year. If you don’t know what I’m talking about yet, you will soon. Hopefully I’ll have the details for that announcement tomorrow, but worst case Monday or Tuesday. And you’ll wanna hear this one, so please stay tuned! It involves the whole community here at my humble blog. You make me proud!! I agree with those that keep telling you the important thing is to finish. I admire your perserverance. Keep up the good work, after all, the self satisfaction is worth the price of admission.